The week of Oct. 1-6, 2018, was gorgeous. Spikes of goldenrod made their final saffron flourish at the edges of Agraria’s forests and fields as the honey bees frantically gathered their last stores of pollen. Abnormally warm air near the ground teased us with the sweet decay of Osage oranges and aster flowers, while the cold nights and crispy leaves of fall sailed overhead like clouds. A group of five students of different ages and backgrounds gathered to study permaculture, learn the contours of the land with its varied assemblies of plants and animals, and envision a world of abundant communities centered in self-reliance. 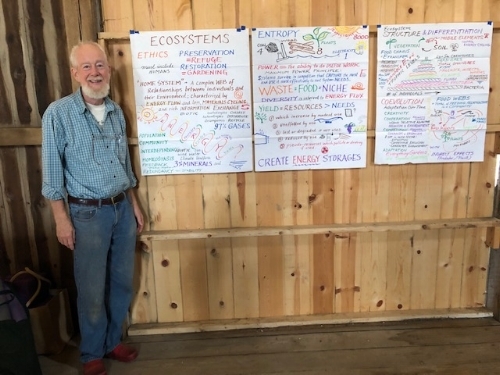 The bio-designers, bringing their own rich decades of experience, met to sharpen minds and earthcare skills with a two-week, intensive Permaculture Design Course (PDC) taught by world-renowned permaculture teacher, Peter Bane. The lead PDC instructor at Agraria and a former board member of the Arthur Morgan Institute for Community Solutions (AMICS), Agraria's parent, Peter is well known for his decades of teaching to thousands of students. He has worked in tropical and temperate regions throughout the Americas, with over 30 years of experience as a small farmer, author, lecturer, publisher, and consultant. The word “permaculture” is credited to J. Russell Smith, author of the notable and still highly relevant 1929 book, Tree Crops: A Permanent Agriculture. The subtitle's last two words, when combined, give us the name for this ecological design science. The core concepts in Smith’s book (food from trees, stable cultivation of the land), and in the design course (nature as teacher; human systems mimic natural ones) are centered around the understanding that integrating people, structures, plants (especially perennials) and animals in well-planned designs can regenerate the foundations of society. Permaculture as a global movement began in Australia during the mid-1970s as a collaboration between its founders, David Holmgren and Bill Mollison. These two men would pen some of the movement's foundational texts and go on to teach generations of permaculture designers. Those hundreds of thousands of students strive to cultivate healthy food production, safe housing, clean water, and just societies in a hundred countries, everywhere with an awareness of Earth’s finite resources and its biological limits. Peter shared, “This year's design class is small, but the students are bringing a lot of heart and intelligence to the work. The questioning and the insights are very rich.” He believes the hands-on, learning projects to manage water and soil fertility have already made a visible impact at Agraria, and believes the students’ final design projects will likely be even more impactful once they are fully implemented. One of the PDC students sees permaculture design as conceiving and growing a place—possibly a garden farm, an edible forest, or a whole landscape – that puts earth first and nestles human nature within it. As the bankruptcy of “cheaper, better, faster” mindset becomes more apparent, a mandate to seek economically viable alternatives develops a certain urgency. The flourishing natural world human beings wish for can be arrived at by design--not disaster. The course, which is taught around the world, begins with a strong foundation in ethics and taking responsibility for Earth, People, and the Future of Life. Understanding that our extractive economy has damaged the planet in catastrophic ways, permaculture designers are taking a fresh look at what resources the planet is losing, at what scope and how fast. We consider how the dominance of one over the other has harmed the well-being of both people and planet. The aim of permaculture is to have lots of fruit and lots of friends as communities work together to create regenerative food systems, agroforests, and resilient, democratic societies. Some key strategies that can guide this planetary design are: the use of recombinant ecologies, modeling the best of nature, pushing succession, gardening, establishing systems using our historic opportunity of cheap fossil energy, domestic self-reliance, and an ethic of cooperation. The first week’s 40+ hours of teaching provide a strong foundation for new designers to understand forest ecologies, design patterns, aquaculture, energy, climate and response to catastrophe—all of which leads the students to their final work on a permaculture design project at Agraria. For this 2018 class, two projects were assigned to two teams: one of these is to design a sustainable campground for program visitors that augments Agraria's educational mission; the other, to design a native food and medicine agroforest in a buffer zone between riparian conservation land and productive micro-farms. These projects will be further developed and presented during the second week of the course, set for late October. We will report on those events in a subsequent blog post. Please stay tuned to learn about the students’ final designs, and more importantly, Agraria’s next offering of this transformative Permaculture Design Course in 2019. Older PostWhat Will it Take to Avert Collapse?